How to Make Money from Clixsense is a site dedicated to helps everybody to make money online from a PTC (Paid to Click) site. 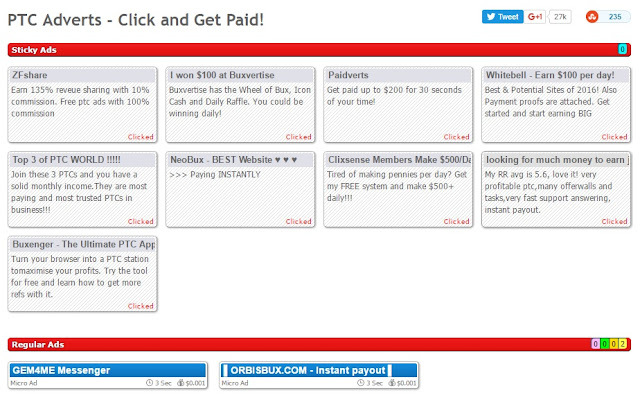 Create your passive income from the internet now! Most people has heard about ClixSense but, many of them do not know how to make money from it. First of all, what you need to do is to signup ClixSense from this link. After signing up, you will be receiving a validation link from Clixsense. There are various methods to get paid, Paypal will be my highly recommended method. As Paypal is one of the most popular ways to receive payment, I will suggest that you join Paypal and choose it to be the payment method in ClixSense. After you have signed up with Paypal, you will need to provide ClixSense the email address of Paypal in order to get paid by ClixSense. As you can see, the time and commission are given as shown in the picture. In the example of the picture for regular ads, you will have to watch the ads for 3 sec to get $0.001. You will find more ads with different time and commission on that page. You have to log in daily to your ClixSense account (Click here if you don't have a ClixSense account) and view all the ads daily in order to earn a good income. It does not take more than 15 mins of your time to view all the ads. To take the surveys, simple click on the Surveys tab and check the available surveys to complete them to start making more money from ClixSense. You will get paid in the range of USD$0.30 to USD$2.00 for completing a survey. When you first sign up (Click here if you don't have a ClixSense account), you will roughly get about 2-6 surveys. You will need to complete your survey profile to get more survey offers from various companies. You can find the survey profile at the 3rd column of the tab as shown in the picture above. It will prompt you for some general questions like age, qualification, marital status, your hobbies etc, so that they will know what type of surveys will best suit you. Not only you get paid on ClixSense for viewing ads, you will make more money from ClixSense if you are able to complete as many surveys as you could in a single day.